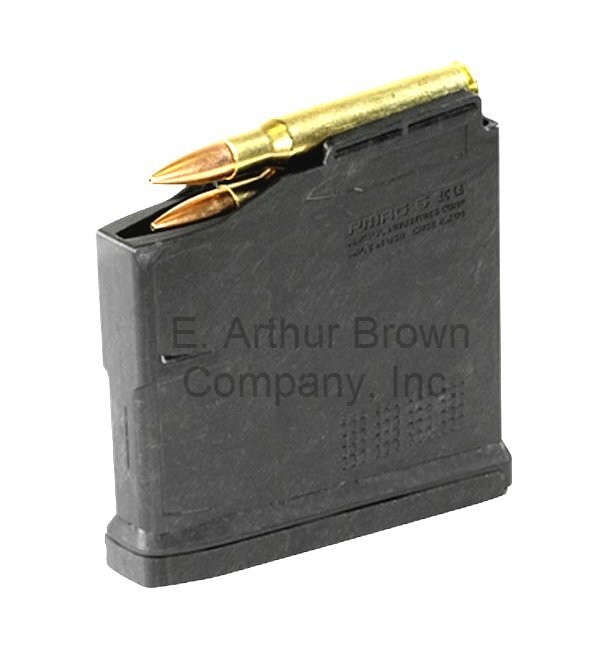 The PMAG 5 AC L, Standard is a reliable and durable polymer magazine for .30-06 based family of cartridges and is compatible with long action AICS-spec bottom metal, to include the Bolt Action Magazine Well 700L for the Hunter 700L Stock. Built using M3 technology, this magazine is advanced in both material and manufacturing processes providing an economical, lightweight, durable and reliable single-stack bolt action magazine. It comes standard as a 5-round capacity magazine for hunting regulation compliance, but the follower can be easily modified by the user to increase the capacity to six rounds for field, competition, or combat use. Accepts a cartridge overall length of up to 3.50"
Length, max outside at feed tower: 3.7"
Length, max at floor plate: 3.9"